The Moto G4 measures 153 x 76.6 x 9.8mm and weighs 155g. Surprisingly, the weight is absolutely identical to the Moto G3 model, which had a 5" screen. The G4 is bigger, however, with its 5.5"IPS LCD. You'll mostly feel it in the width - 76.6mm is slightly above average for a 5.5" Android, though the iPhone 6s Plus is even wider. The G4 is only about 4mm wider than its predecessor and still manageable with one hand. It's also thinner, which was a bit of an issue for the G3 (9.8mm vs. 11.6mm) and yet it has a bigger battery (3,000mAh vs. 2,470mAh). 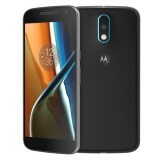 When you look at the Moto G4 design and you can instantly recognize it as a Motorola, you don't even need to see the iconic M on the back. 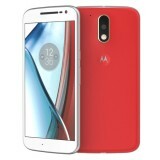 For us, it's probably the way the top side of the frame curves around the 3.5mm headphone jack, just the way it did on the original Moto X from 2013 as well as the Moto G3 from last year. Or it could be the small dimple where said M resides. Carrying on the design language is important for brand recognition, but it's also great that the company has maintained the build quality as well. The Moto G4 feels rock solid and you wouldn't have a hard time to pass off the side frame as metal (it isn't, though). The finely textured back cover feels soft and is very grippy. Even with a loose grip you never worry that you may drop the phone. The back is a fingerprint magnet, but at least it can easily be swapped out. 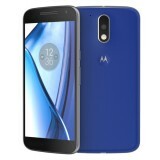 The Motorola.com site (still the home of Moto phones) promises you'll be able to customize the front, back and accent colors using Moto Maker where that's available. The front is a choice between Dark Moon (deep blue) and Metallic Silver (white front/silver sides), the back has a wider choice of colors, eight, and there are five options for the accent around the camera. Additional customization is available too - such as engraving the phone or changing the greeting message. On the front, the side frame sticks out above the Gorilla Glass 3. It means the screen glass will never touch a flat surface and if you happen to drop the phone, it will be the frame that absorbs the initial impact. Carved into the glass above the screen is a pretty chunky hole for the earpiece. It's also the loudspeaker, so you can enjoy a front-firing speaker (back or down-firing speakers aren't great for watching videos and occasionally get muffled). We also like the metallic rim accent, which breaks up the monotony of the black glass. 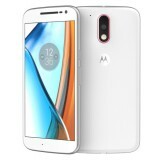 The Moto G doesn't come with any notification LED. Instead, it relies on Moto Display to alert you of any new notifications. Moto Display is a monochromatic clock, which is visible even when the screen is off. This is one of the few proprietary features Motorola has added to the otherwise vanilla Android experience. It activates for a bit when a new notification arrives and again when you move the phone (you can also trigger it with a double-tap), but keep in mind this isn't what is known as an Always On screen. The mouthpiece is below the screen and, of course, there aren't any keys here. Motos have long adhered to the on-screen button design. Note that on the G4 Plus there will be a square fingerprint reader here. We're surprised we have to say this, but its lack on the G4 is actually a positive thing from an aesthetic point of view. The Moto G4 has two wired ports - a 3.5mm headphone hack on top and a standard microUSB 2.0 on the bottom. The USB port is USB On-The-Go enabled, so you can hook up USB storage and accessories. It also supports TurboPower charging, but more on that in the battery life section. The right side of the phone is home to the two sole hardware buttons that the phones has. The Power button has a nice grooved texture, which makes it easily distinguishable from the volume rocker below it. If you pop open the back cover, you'll see the SIM and microSD card slots side by side. Our review unit is a single-SIM model. You can see the 3,000mAh battery, but it's sealed and you can't take it out. It's an oddly-shaped battery, sure, but we still think it wouldn't have impacted the design too much if it was user-serviceable. There is nanoSIM adapter supplied, which would allow you to insert a nanoSIM card instead of a microSIM one. Anyway, let's put the cover back on. Much like the Moto G3, there's an "island" that holds the camera and flash that's vertically oriented along the center line. It's smaller now, made of glass with a metallic accent. This island is a hump, protruding slightly from the back. The way things are positioned, this hump is unlikely to cause scratches on the camera glass or too much wobble. Still, humps are for thin phones and 9.8mm doesn't count as "thin" for a long time already.